This is in response to those who asked:”Who are you?” It is a least a dimension.Boats have always been a part of my life. Naturally interwoven with the story of Newport. Carl Eichenlaub passed away early this morning. In a sport full of iconic figures, he stands with the best and most unique. Few people in the sport have the breadth and depth of his talent. Any one of his many accomplishments would have made him worthy of inclusion in a list of greats. 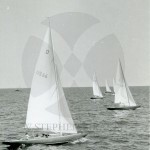 Champion sailor in the Snipe, Lightning, while also sailing in the Star, Soling, FD’s and IOR classes. As a builder of those boats, a few of which helped to change the face of the sport, perhaps most notably Doug Peterson’s “Ganbare”. Friend and mentor to literally thousands of people around the world. Carl’s boat building skills were legendary. “In many ways Carl is a genius,” says Lowell North, a sailmaker who has three times sailed himself to a world championship in Eichenlaub Stars. “Although some sailors on the East Coast may not agree, we on the West Coast know that he is the best.” This quote was from an extensive Sports Illustrated article in 1965, the entirety of which is well worth reading, because it captures the essence of the man, which almost literally never changed. Anyone remember the slogan “Any slob can win in an Eichenlaub”? Away from the sport he played classical music on a bassoon and contrabassoon with several different local orchestras. He loved the San Diego Chargers and NASCAR and in recent years had taken to traveling to what he called “Dog Regattas”, otherwise known to the rest of us as dog shows, with his wife Jean and their herd of dogs. A graduate of San Diego State in ’53, Carl is a member of the Intercollegiate Sailing Hall of Fame and is an SDSU Distinguished Alumni. He was 83 years old. He passed away quietly with Jean and his children Betty Sue Sherman and Brian close by. 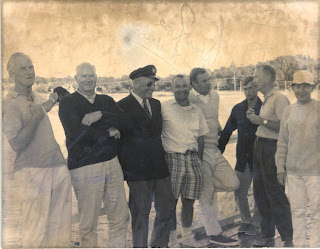 While winning races and building great boats for customers is interesting, of far greater importance is the esteem with which he was held in the sport. 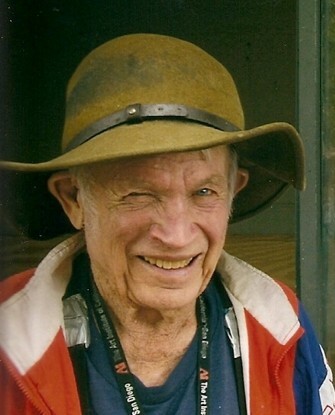 Carl was the shipwright for the US Sailing team for decades. He always took care of the US team first every day, but after that work was done he would help sailors from other countries fix their boats. 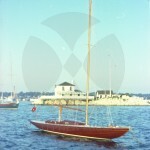 For the sort of service he gave to the sport in 2000 he was awarded US Sailing’s highest honor, the Herreshoff Award. I was in San Diego just one month ago. I saw Carl’s Daughter and asked after him. She replied that he was at the boat shed working. I first met Carl when I was in San Diego, rebuilding a Dragon for the Olympics. That was 1971. The boat had been built by Kelvin Savell, a close friend of Carl’s and another lover of classical music. Kelvin’s first love was building musical instruments, but boatbuilding gave him a living. Our paths crossed a number of times after that. 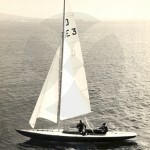 When Carl was about to build his first aluminum hull, we spoke, I had just finished “Courageous” the 12 meter. I told Betty Sue the story and how the idea of this remarkable group in San Diego was a thought that remained with me. 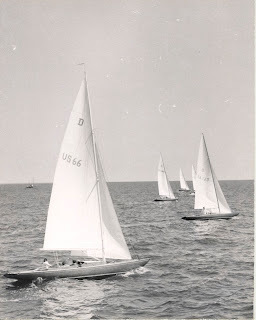 The Dragon Class has long been my favorite keel boat, both as a design and the class association. (The six metre class is a close second). In 1948 Queen Elizabeth and Prince Philip were presented with ‘Bluebottle’, a Dragon built by Camper and Nicholson and paid for by members of the Island Sailing Club in Cowes. Today she is on loan from Prince Philip to the National Maritime Museum in Falmouth, UK, where she can be seen on the Museum pontoon during the summer months and even has the occasional sail in fine weather. Although Prince Philip did not sail her extensively, she was sailed by a number of crews, and even won a Bronze Medal in the Melbourne Olympics of 1956. ‘Bluebottle’ then spent nearly 40 years as a sail-training vessel at Britannia Royal Naval College until 2001 when she was lent to the Museum. To find out more about Bluebottle please visit the National Maritime Museum website. Prince Philip has most generously consented to the loan of ‘Bluebottle’ to the Solent Dragon Association for the duration of Aberdeen Asset Management Cowes Week 2011 and the boat will be on display at the Aberdeen Asset Management hospitality pavillion in Cowes Yacht Haven Regatta Village. Members of the public will be able to view ‘Bluebottle’ and learn about her history. To celebrate the Duke’s nine decades – the Solent Dragon Fleet will be hosting a Bluebottle Champagne Reception and Dinner on Sunday 7th August, at the Royal Corinthian Yacht Club – under the steady gaze of Princess Anne who’s portrait hangs in the main reception. 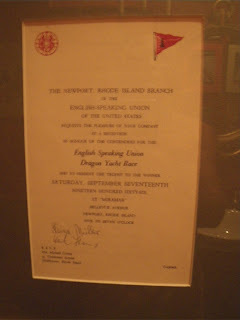 The dinner is open to all Dragon sailors and their guests and to those with a special connection with Prince Philip’s Dragon sailing history. I am still kicking myself for not taking photographs of this trip. A friend( Tom Dykstra) called and asked if I would help tow a Dragon ( then an Olympic Class) from Miami to San Diego, I flew to Miami and the next morning we took off. we got as far as Orlando, where we were forced to stay overnight as a new transmission was installed. (a harbinger of things to come) Drove to Pensacola , without adventure. Our goal had been to drive 600 miles a day. With two of us driving it sounded feasible. We changed drivers each time we filled up with gas; which was about every two hours, as it turned out. The Next night found us in New Orleans. I made a call and chose a well know restaurant, and ordered a $50.00 bottle of St. Julian to go with my steak. We looked a little scruffy and the restaurant didn’t quite know what to do with us. Leaving New Orleans, driving on small roads through the bayous; bermed. I had the feeling that if we went off the road, no one would know and certainly not even think to look for us. Into Texas, This state seemed to last forever, it accounted for 1000 miles of the trip. We drove until San Antonio, finding a motel in front of the Alamo. It was also my first experience on a waterbed. I thought I would freeze, not understanding I needed to turn on the heater. Each day, started early, in an attempt to meet our goal of 600 miles. Into New Mexico. Almost running out of gas in the desert. I stayed with the boat, while Tom drove for gas, a lonely feeling. That night, still driving, something was wrong. the alternator had failed. nothing was open. Finally, someone suggested that someone off in the desert worked on cars might have something to help us. Off we went driving without headlights, towing 7,000 pounds. Finding a shack, we knocked and sure enough he had an alternator of the right amperage but not designed to fit the car we were driving. we fashioned spacers and bolts. Off we went, on the road again. Exiting the highway near Gila Bend, the timing gear and chain failed. We were towed to he gas station, which was just closing. Old Jerry Beet, offered to drive us to a motel, but wanted to stop for a drink on the way. It was a place straight out of a movie. A low roof, old trailers behind it. surrounded by sagebrush. Inside,smoky, dimly lit, full of beer, people playing pool. Jerry was a regular, we sat at the bar, I was feeling particularly out of place. a girl came up behind me, rubbing her chest across my back, with the words “hey baby, want to mess around?” Jerry giggled, with the words, she’s good, I’ve already tried her. I try all the new girls. That’s what the trailers were for. Once the car was back together, off again,we could now feel that the conclusion of our adventure was near. Driving through the pass in the mountains, the transmission was smoking, we did make it through however. Shortly after that we were stopped by the highway patrol, and ticketed for having an excessively dirty car. I was in disbelief, welcome to California. I remained in San Diego for several months re-building the boat for the Olympics, (the boat earned a bronze medal) We were working at Kevin Savel’s place. He had built the boat. and was the foremost builder of Dragons at the time. His true love was building string instruments, however he could not earn a living at that, so he turned to boats. San Diego was a small navy town at the time. 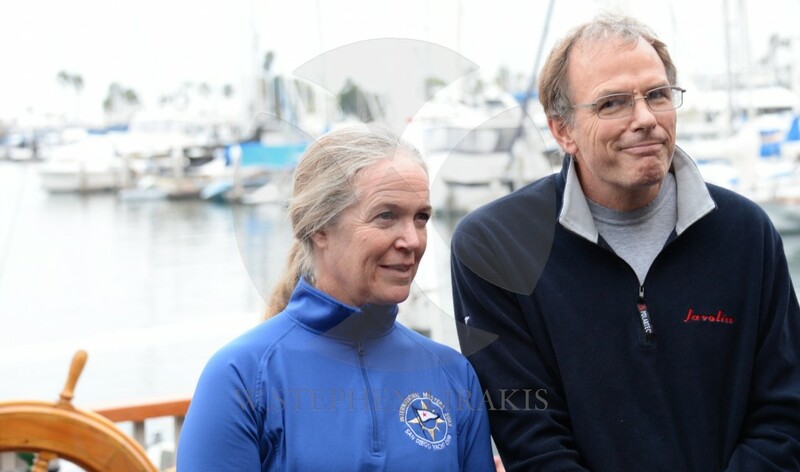 I had met Hoyle and Diane Schweitzer(the creator of windsurfing) a few years earlier, and we spent many weekends sailing windsurfers with them. 1966 the year I graduated from high school. 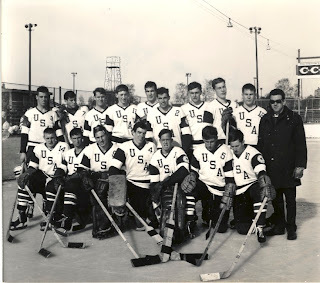 In March of that year I traveled to Europe on a hockey team modestly called ” The United States All Stars.” A group assembled from schools principably around the Boston area. The photo taken in Sweden after our toughest match of the tour. The majority of the team went on to Harvard, and four of them signed with NHL teams. 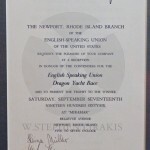 In September I postponed my entry into my freshman class in order to sail the English Speaking Union International Dragon Races. I had been loaned a boat by Archibald van Beuren. The boat was not really competitive, however the experience was memorable.